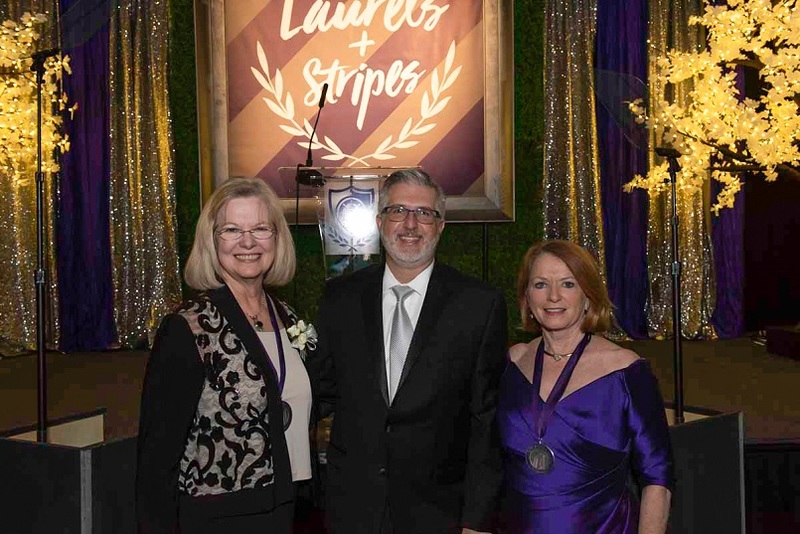 The University of Central Arkansas raised $719,000 in private scholarship support at its debut Laurels & Stripes fundraising gala, which was held Saturday, March 30, in the HPER Center on campus. With almost 600 people at the event, records were set for both attendance and amount raised at the annual event. All funds raised benefit much-needed student scholarships. The newly energized premier fundraising event, formerly known as Night of Distinction, welcomed two outstanding graduates to the ranks of UCA’s most prominent alumni. Elizabeth “Liz” Blankenship ’75 and Dr. Barbara Williams ’71 were recognized during the program as the 2019 Distinguished Alumni Award recipients, the most prestigious award presented by the university. Blankenship is an entrepreneur and advocate who has dedicated more than 40 years to the creation and support of quality health care and assisted living facilities for seniors. She designed and built the first assisted living, home-style cottages in Arkansas, and her facilities have received numerous awards for quality. “I hope my journey will inspire young people, especially UCA students who have dreams, that you can realize your dreams by daring to move forward and doing them no matter the obstacles or challenges you encounter,” said Blankenship. Williams is a former chair of the UCA School of Nursing, a role she held from 1990 to her retirement in 2016. During her time as chair, Williams oversaw significant enrollment growth and numerous program innovations. Williams has served on numerous boards, including the Conway Regional Health System board of directors, the board of the Arkansas Association of Hospital Trustees and CHI St. Vincent. Presented by First Security Bank and co-chaired by Todd and Kristie Ross of Conway, Laurels & Stripes was an energetic evening that offered “a new take on tradition.” Guests enjoyed a premium dinner, a brief program, music and dancing until midnight, and a complimentary chicken nugget bar provided by Chick-fil-A. Co-chairs for Laurels & Stripes 2020 will be Dr. Jeff and Lori Standridge. The event will be held Saturday, April 4, at the UCA HPER Center. Laurels & Stripes comes on the heels of another successful fundraising effort, the March 7 Day of Giving. During the 24-hour drive, a total of 1,386 donors raised $757,939. For more information about Laurels & Stripes, contact Amanda Hoelzeman at ahoelzeman@uca.edu or 501.852.2659, or visit laurelsandstripes.com.